Poison oak grows in the southern US and along the Pacific coast line. Like poison ivy, poison oak has three leaves branching off a single stem, but the leaves as scalloped and rounded at the tip. Poison oak leaves will turn red in the fall. Poison ivy, poison oak and sumac all cause similar types of rashes . Why does poison oak make me itch? Poison oak plants contain an oily sap called urushiol. Urushiol causes a skin rash in 85% of the population. Urushiol will stick to clothing, shoes, tools and even pet’s fur. Anytime you touch it – even weeks later – you risk getting a rash. No. Poison oak is only be transferred when urushiol gets on your skin. The fluid in the blisters does not contain urushiol and can’t pass the rash. But when someone with poison oak gets urushiol on a garden tool and doesn’t wash it off, if you touch that tool, it’s very possible you will get poison oak. Even uprooted or dead poison oak plants aren’t safe – urushiol is active for up to five years. Can poison oak be prevented? 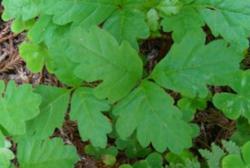 The best way to avoid the rash is to avoid the poison oak plant. Keep your dogs close when walking in the woods – if they get urushiol on their fur and they pass poison oak to any humans who pet them. If you know you touched poison oak, wash it off immediately. Urushiol absorbs into the skin in under 3 minutes. The rash will normally last for 12 to 15 days. Can poison oak get infected? Yes – repeated opening of the blisters in the poison oak rash may leave you subject to infection. As much as humanly possible, try not to scratch the rash. For the most part, poison oak is uncomfortable as opposed to dangerous. Try over the counter medications to relieve the itch, like calamine location or antihistamines. When do I need to go to the doctor for poison oak? Find the FastMed walk-in clinic nearest you if the poison oak rash spreads to your face or genital area, the blisters on your rash continue to ooze after two weeks or you get a fever. NEVER burn plants containing urushiol – inhaling the smoke can cause serious problems for your lungs or esophagus. If you think you’ve inhaled smoke with urushiol, seek medical treatment immediately.